I joined Brixton Library when I became a freelancer in 2007. It was a big adventure and I was scared of being lonely and broke. Joining the library was a way of anchoring myself with a community as I would no longer have the community of my colleagues. It was also a way of saving money and all my reading came from the library. 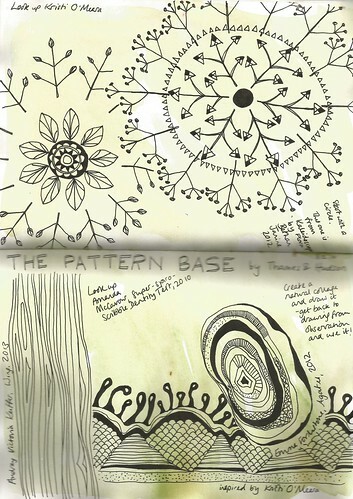 And it was a resource – I was able to use the photocopier and take inspiration from a wide range of books for my workshops. 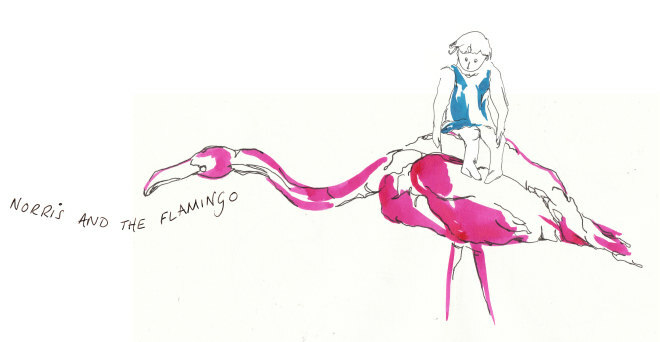 I took a pause from libraries when I was working full time and moved to Loughborough Junction. But when I was pregnant, once again I joined my local library – Carnegie Library, the beautiful, even magical building that hovers at the top of my hill. I couldn’t believe that such a beautiful place was there for ordinary people like me to use. Walking up there when Feets was tiny. Walking her to sleep in the sling was my salvation from the worst time of day – the hour or two before Liam came home, when she would cry and cry and cry. It was wearying, dancing around the house, making up a song to learn all the countries of Africa from the map on the wall, while she carried on crying. Monday evenings, the library was open, and the ‘civilised’ hours of the day became longer. I enjoyed some glorious peace sitting in the library and reading, with Feets asleep on my tummy. Meeting Claire and Conni, two very special and very local mum-friends who, like me, appear at the library most Friday mornings for Wriggle and Rhyme time. We’ve been going since Feets was about 3 months old, when the session felt daunting but welcoming. It’s grown bigger and bigger in the meantime, as the library re-arranged itself to fit us all in. Now Feets is one of the big(ish) children, who the babies have to watch out for! And, proud Mum as I am, for the first time last Friday, Feets sat down and joined in for the whole session. Until now, she’s had a blissful time rearranging the books on the shelves, and delivering them to the different parents and children around the room. The amazing thing is, the librarians just don’t mind – they even claim it’s what the library’s there for … to nurture a love of books. We are never there for less than an hour and a half on a Friday. Taking out ‘just three books’, then ‘just four books’, and ‘just five books’ until I can’t resist and I realise we have eight books at home – three for Feets, three allegedly for Feets but really for me because they’re beautifully illustrated, one on how to cope with toddlers and another for my book group. Meanwhile, Feets chooses books from around the library and posts them through the ‘returned books’ slot. And once again, the librarians just smile and accommodate. Graphic Novels. You can’t buy graphic novels - they are beautiful but expensive, and I’m never sure that I’m going to like them. I would NEVER have read graphic novels if the library hadn’t invited me to try them out. Listening to live, classical music from the Dionysus Ensemble, especially laid on for children. Feets doesn’t see a lot of live music and she loves to dance. The room is packed to the brim and it’s a glorious, musical chaos. Bach-to-baby is fabulous, but it’s really expensive, and we can’t afford to go any more. There’s nowhere else I can take my daughter for affordable live music. Yesterday, Feets and I passed three hours at the library. We joined the rally against the closures and took over the road, cheering as passing cars honked their support and moving out of the way for the P4 bus. 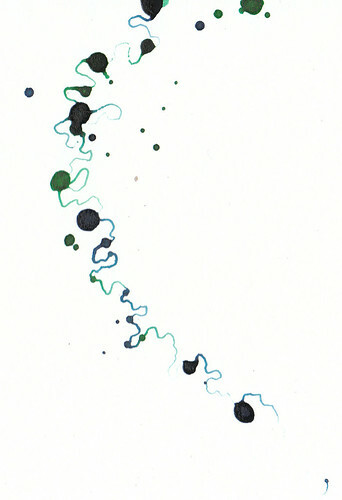 As Feets slept, I passed a glorious hour or two drawing from a book of patterns – my quiet island of peace. And she woke just in time for some jazz music, laid on by the Friends. Feets was fascinated by the saxophone and got very two-year-old upset when it was time to leave. ‘Stay’ is her new favourite word. 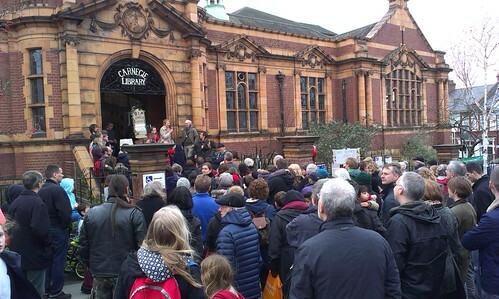 And the other magical thing about yesterday … the library was full of all sorts of people, who were warm, friendly and fascinated by her (nothing like appreciation of your daughter to make her mum feel welcome), including friendly but not-intrusive older people. Feets is ‘scared’ by older people – she doesn’t see enough of them. And I realised that we should be coming here even more often, at different times, that Feets can understand how our community is made up. 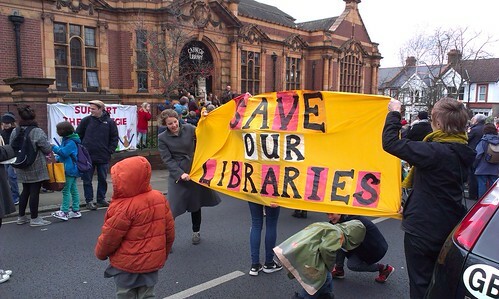 The community that I have become a part of for the first time since I came to London thirteen years ago is at risk, and yesterday I realised that, as others have said too, the library just CANNOT be closed and given away. I realise that there is absolutely nowhere else to go on a rainy day without paying. London is full up with people, and community spaces are overflowing to bursting. I don’t know what we’ll do, Feets and I, without this space, its books and the community that comes with it. I imagine we’ll cope somehow, but I fear there are many who won’t. Where will the people on the computers go for help with their typing? Where will the older folk go who just need to see a friendly face? What about the kids who need help with their homework, whose parents aren’t sure where to start? What about the mum who’s baby won’t stop crying – the me from the past, perhaps the me from the future? And will I have to quit my book club because I can’t afford a brand new book every month? Images are of yesterday's rally, and yesterday's sketchbook.